I am using the beautiful PTU kit called Angel by AmyMarie. The tube I am using is called Pretty Dreams by Zindy S. D. Nielsen. When I downloaded this item, it was on her Free Tube list. It is no longer there. With that said, if you don't have it, use your tube of choice. Use my tag as a reference for placement of elements. C/P 6 & resize 80%. I merged my tube & frame. C/P 24 & resize 50%. C/P cloud1 & resize 50%. C/P 79 & resize 60%. C/P 71 & resize 40%. C/P 56 & resize 40%. C/P 55 & resize 40%. The kit I am using is Emo Star by AmyMarie. The tube I am using is EMO Star by ICZTubez. Both are available at SATC. Please refer to my tag for placements for elements. C/P 1frame2 & resize 40%. 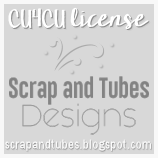 C/P your closeup tube & resize 43%. Close your background & Merge visible layers. C/P 6, 7, 8 & 9 & resize all 4 elements 40%. C/P 23 & resize 40%. C/P 37 & resize 40%. C/P 56 & resize 50%. C/P 77 & resize 35%. 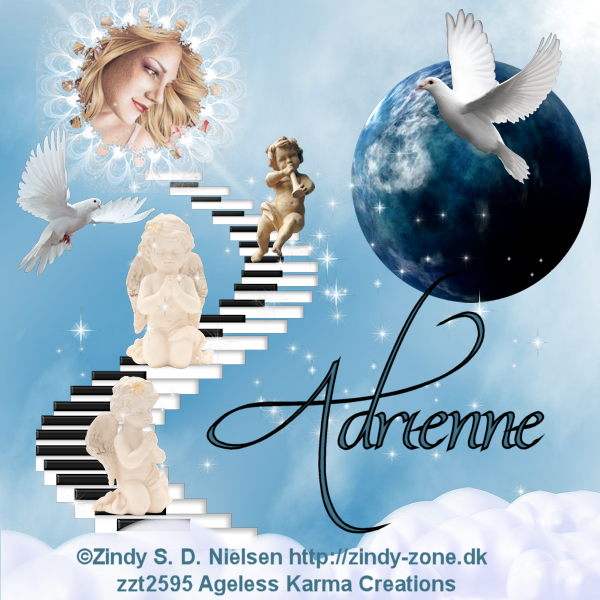 Now you can add the Artist Copyright & your Watermark. I used the font Arial with a size 11. For the Tag Name, I used the font Channel with a size 44. The PTU kit I am using is called SexNCandy2 by AmyMarie. The mask I am using is AM_Mask3. C/P pp010 & resize 75%. C/P 38 & resize 40%. C/P lip2 & resize 40%. C/P w-sexncandy3AM12 & resize 60%. C/P corsetthong1 & resize 40%. Rotate 45 degrees to the left. C/P corsetthong2 & resize 40%. Rotate 45 degrees to the right. C/P 41 & resize 60%. Flip & place behind the tubes head. Make it look like she's holding the whip. C/P flower1 & resize 40%. Well that's it, I'd love to see your work. Please send to agelesskarmacreations@yahoo.com. 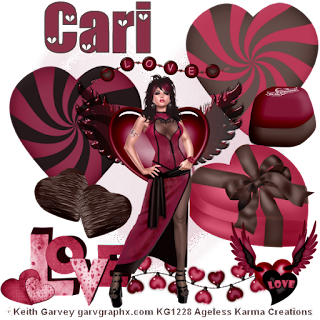 I am using the PTU kit called Goddess Of Love by Black Widow Creationz. Click Goddess Of Love to purchase. I am using the matching tube called Goddess Of Love by Keith Garvey. The mask I am using is Monti Jagged Heart Mask by Monti's Pixel Playground. At this step I applied my Mask. C/P BWC_GoddessOfLove_EL28 & resize 50%. C/P BWC_GoddessOfLove_EL31 & resize 50%. C/P BWC_GoddessOfLove_EL29 & resize 60%. C/P BWC_GoddessOfLove_EL12 & resize 60%. C/P BWC_GoddessOfLove_EL30 & resize 50%. C/P BWC_GoddessOfLove_EL36 & resize 80%. C/P BWC_GoddessOfLove_EL37 & resize 80%. C/P BWC_GoddessOfLove_EL32 & resize 40%. At this time, please add the proper copyright. Please make sure you have a license to use the artwork. I'd love to see your results of this tutorial. Please send them to agelesskarmacretions@yahoo.com.